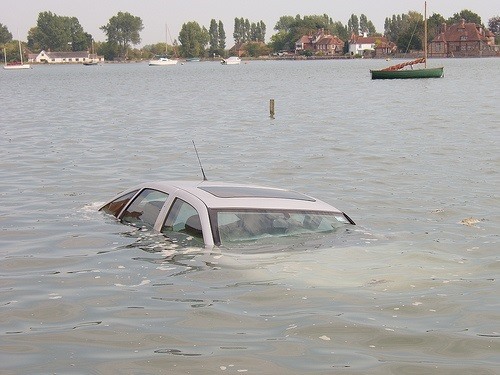 If you ever find yourself in a car that's submerged under water, your first instinct should be to try and open either the window or the door in the first few seconds of touching water. Unfortunately, if you wait any longer than that, the lopsided ambient water pressure subjected to the car will make it impossible to open the car door, and the now ubiquitous power windows will likely short out. Sure, you could wait until the pressure has equalized on both sides of the car, but this usually happens after the car fills with up water and hits the bottom of wherever you're sinking into. By the time the car door can be safely opened, you'll be dead. Another tactic, which is preferable to waiting and dying, is to take action. Look around your car and search for any sharp or blunt objects, (skateboard, umbrella, hammer, gun) which you can then use to try and shatter the glass window and escape. If you can't find anything, you might resort to kicking or punching the window with your fist. Bad idea. Save your energy and oxygen. So as the car is filling with water and it's slowly creeping up your legs and past your waist, what other options do you have other than accept your deadly fate? 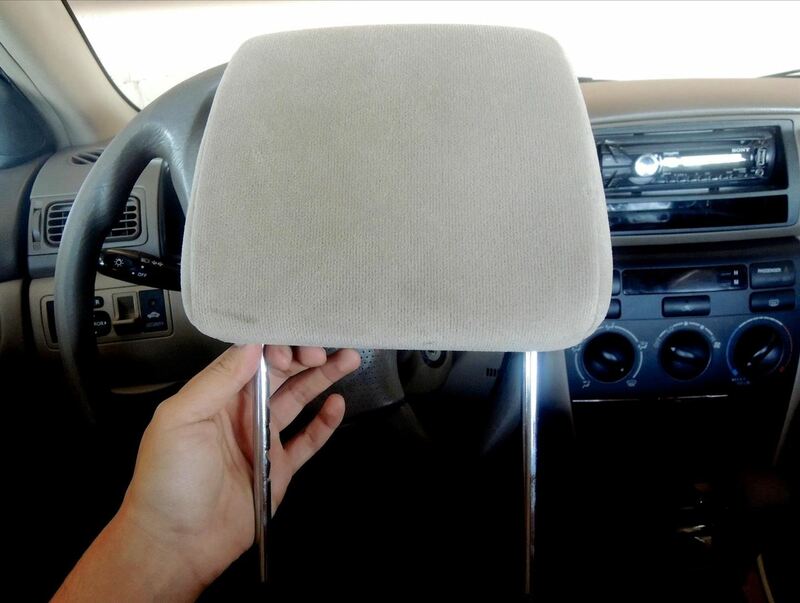 Serving to prevent severe neck injuries, removable headrests can also help save your life when your car is sinking in water. 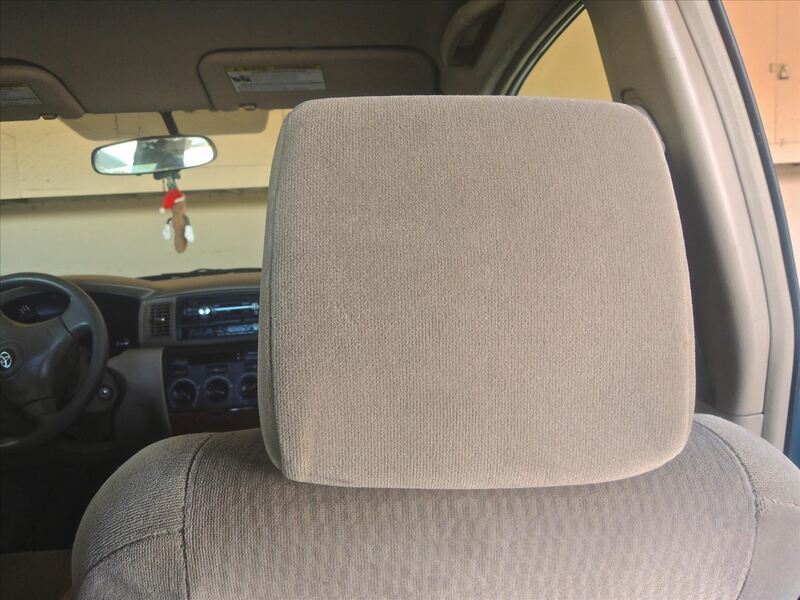 While not ALL headrests are detachable, the majority of them are. It makes the seats easier to install and uninstall by the factory, and allows many seats to lay back flat when removed. Luckily, this can also serve another purpose. If you're in a sinking car, remove the headrest from your seat. Place one of the two medal rods between the window and the door and insert it into the car. Make sure to slide it in on one of the bottom two edges of the window, because that's where it's weakest. 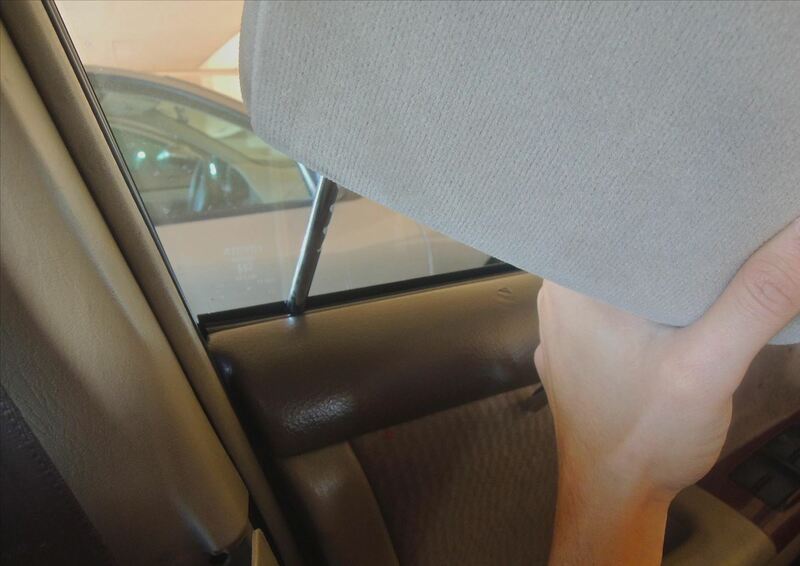 After the rod is snug inside, pull the headrest towards you and the window should shatter. You can see this method being performed in a sinking car (at 0:20 seconds) in the video below. With a simple pull the entire glass will shatter (so close your eyes), allowing you to easily break off the glass that hasn't fallen, with your hand. So if you ever find yourself in this disastrous situation, don't panic and just remember about your headrest—it may just save your neck in more than one way. If you read the article you would know that wasn't an option.